Because I Said So! 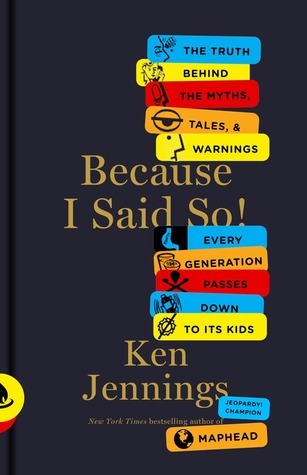 : The truth behind the myths, tales, and warnings every generation passes down to its kids by Ken Jennings is perhaps the only book I can think of that I can wholeheartedly, unreservedly, recommend to EVERYONE, even those who usually don’t read nonfiction. Young or old, male or female, left brain or right brain, parent or child, skeptical or gullible, superstitious or scientific, this book is for you. Really. Truly, I recommend this to everyone. And, the scheduled publication date is December 4, just in time for the holidays. Usually, I try to avoid giving books as gifts (partly because I’m a librarian and people expect it), but I’ll probably be buying this for at least one person. So there: it has the librarian stamp of approval! Ken Jennings, the Jeopardy guy?! Awww heck yeah. I’m so going to be buying this!